A Non Disclosure agreement ( NDA ) or confidential disclosure agreement (CDA) / secrecy agreement (SA) / confidentiality agreement (CA) / proprietary information agreement (PIA) is form of legal contract between Two or More parties ( Disclosing Party & Receiving Party) who share some confidential information or Knowledge about Some business opportunities. Even if the proposal is not accepted by the receiving party, he / she should not disclose the details of the proposal to someone else. 3. The Disclosing Party wishes to ensure that Confidential Information so disclosed to the Receiving Party remains confidential in accordance with the terms of this Agreement. “Authorized Representatives” means any director, officer, employee, agent, consultant or any third party professional adviser representing any of the Parties. “Confidential Information” means any and all technical and non-technical information provided by the Disclosing Party to the Receiving Party, including but not limited to patent and patent applications, trade secrets, proprietary information, ideas, techniques, sketches, drawings, work of authorship, models, inventions, know-how, processes, apparatuses, equipment, algorithms, software programs, software source documents, and formulae related to the current, future, and proposed activities, products and services of the Disclosing Party, and including, without limitation, information concerning research, experimental work, development, design details and specifications, engineering, financial information, procurement requirements, purchasing, manufacturing, customer lists, investors, employees, business and contractual relationships (actual or prospective), business forecasts, sales and merchandising, marketing plans and all or any information that the Disclosing Party provides to the Receiving Party regarding third parties, including all such information in whatever form supplied or received (whether in oral, physical, visual, written, magnetic, electronic, digital or any other form) which is directly or indirectly disclosed or made available before, on or after the date of this Agreement. Any information that is not readily available to the public shall be considered as Confidential Information, (irrespective of whether such information is marked confidential or not) and, therefore, within the scope of this Agreement, unless specified otherwise in writing. “Group” means either Party’s holding companies, subsidiaries and related companies. “Party or Parties” means either or both of the Disclosing Party and the Receiving Party, as the context requires. “Transaction” means to purchase equity shares of the Company. 1.1. Subject to Clauses 2 and 5, the Receiving Party shall at all times and notwithstanding any termination or expiration of this Agreement hold in strict confidence and not disclose to any other party the Confidential Information of the Disclosing Party, except as approved in writing by the Disclosing Party, and will use the Confidential Information for no purpose other than the Permitted Purpose. Notwithstanding the above, the Receiving Party shall not be in violation of this Clause with regard to a disclosure made in accordance with Clause 1.3 provided that, where permitted, the Receiving Party provides the Disclosing Party with written notice of such disclosure. The Receiving Party shall only permit access to Confidential Information of the Disclosing Party to those of its Authorised Representatives having a need to know and who have signed confidentiality arrangements and are bound by confidentiality obligations equivalent to those contained herein. 1.2. The Receiving Party agrees not to disclose to any third party the fact that Confidential Information has been made available or that discussions or negotiations are taking place, or have taken place between the Disclosing Party and Receiving Party in connection with any proposed Transaction. 1.3. The Receiving Party shall not, without the prior written consent of the Disclosing Party, use any portion of the Information to solicit business, whether it is from the Company’s customers or otherwise. This restriction shall not prevent contacts in the ordinary course of business. 1.4. The Receiving Party shall not, for a period of 24 months after the date of this undertaking, without the prior written consent of the Company, directly or indirectly, employ or offer to employ, or enter into a contract for the services of, any individual who was, at any time during the evaluation of the Transaction, an employee holding an executive or managerial position with the Company (a “Key Employee”), or entice, solicit or procure any Key Employee to leave his employment (or attempt to do so). The placing of an advertisement of a post available to a member of the public generally and the recruitment of a person through an employment agency shall not constitute a breach of this paragraph, provided that we do not encourage or advise such agency to approach any Key Employee. 1.5. The Receiving Party shall not, without the prior written consent of the Company, use any portion of the Information to solicit business, whether it is from the Company’s customers or otherwise. This restriction shall not prevent contacts in the ordinary course of business. 1.6. The obligations to maintain confidentiality set out in this Clause 1 shall not apply to any information, (i) where such information was requested or required by a court of competent jurisdiction or any other competent judicial, governmental, supervisory or regulatory body; (ii) where such information is required by the rules of any stock exchange on which the shares or other securities of any member of the participant Group are listed; or (iii) where such information is required by the laws or regulations of any country with jurisdiction over the affairs of any member of the Group. Confidential Information shall not include any information disclosed by the Receiving Party which (i) was previously in its possession (ii) was received from a third party without violation of any obligation of confidentiality; (iii) was publicly known and made generally available prior to such disclosure; (iv) becomes publicly known and made generally available, through no action or inaction of the Receiving Party, after such disclosure; or (v) can be proven to have been independently developed by the Receiving Party without using or referencing Confidential Information. 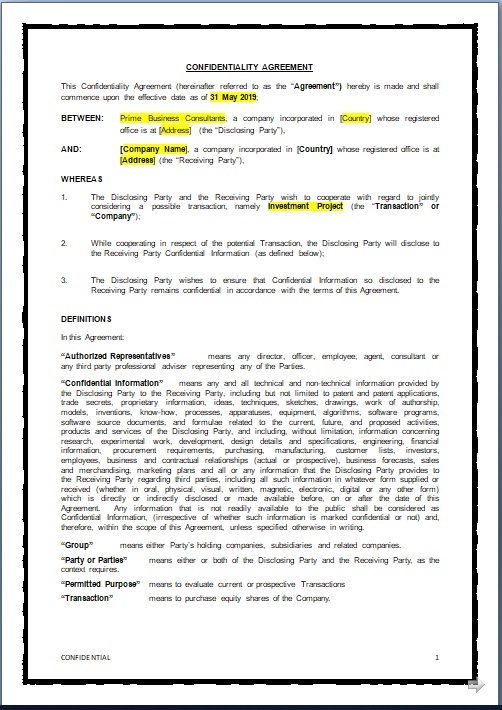 The Disclosing Party agrees that Confidential Information may be disclosed by the Receiving Party to their officers, directors, Group, Authorized Representatives, employees and authorized professional advisers such as auditors, management consultants and / or any other third party advisor in order for the Receiving Party to enter into discussions and negotiations to the extent necessary to achieve the Permitted Purpose. The Receiving Party agrees (to the extent permitted by law and / or by specific situation) to inform the Disclosing Party as soon as reasonably practicable of the full circumstances of any disclosure upon becoming aware that Confidential Information has been disclosed in breach of this Agreement. Confidential Information shall not be reproduced in any form except as required to accomplish the intent of this Agreement. Any reproduction of any Confidential Information by the Receiving Party shall remain the property of the Disclosing Party and shall contain any and all confidential or proprietary notices which appear on the original, unless otherwise authorised in writing by the Disclosing Party. On reasonable demand by the Disclosing Party, but in any event upon termination of this Agreement or the business relationship between the Parties, the Receiving Party shall surrender to the Disclosing Party all Confidential Information that has been obtained from the Disclosing Party. Furthermore the Receiving Party shall destroy or permanently erase all copies of Confidential Information made by the Receiving Party and use all reasonable endeavours to ensure that anyone to whom the Receiving Party has supplied any Confidential Information is notified to permanently erase such Confidential Information and any copies made by them, save to the extent that either the Receiving Party, or anyone to whom the Receiving Party has supplied such Confidential Information to, is required by any applicable law, rule or regulation or by any competent judicial, governmental, supervisory or regulatory body or in accordance with internal policy to retain such Confidential Information. This Agreement hereby shall remain in force for 24 months following the effective date. The Receiving Party agrees and acknowledges that in the event that some or all of the Confidential Information is or becomes price-sensitive information, the use of such Confidential Information may be regulated or prohibited by applicable legislation relating to insider trading and the Receiving Party agrees not to use any Confidential Information for any unlawful purpose. The Receiving Party will not assign or transfer any rights or obligations under this Agreement without the prior written consent of the Disclosing Party. No failure or delay in exercising any right, power or privilege under this Agreement will operate as a waiver thereof, nor will any single or partial exercise of any right, power or privilege preclude any further exercise thereof or the exercise of any other right, power or privileges under this Agreement. If any part, term or provision of this Agreement shall be held void, illegal, unenforceable, or in conflict with any law having jurisdiction over this Agreement, the validity of the remaining portions or provisions shall not be affected thereby. 10.1. The obligations contained in this Agreement shall take effect on the Effective Date and shall last for 2 years from the Effective Date, subject to earlier termination under Sub-Clause 10.2 below. 10.2. This Agreement may be terminated by the Disclosing Party on the provision of thirty (30) days’ notice to the Receiving Party at any time without having to state a reason therefore, provided, however, that all obligations hereunder with respect to the confidentiality and nondisclosure of any and all Confidential Information received prior to the termination of this Agreement shall survive such termination for a period of one year of such termination. Nothing contained in this Agreement shall be construed to create an exclusive contractual arrangement, association, trust partnership or joint venture or impose a trust or partnership or fiduciary duty, obligation or liability between the Parties other than as provided in this Agreement or to create any duty, standard of care or liability to any third party. It is understood that any participation to the proposed Transaction by a member of the Group of a Party shall be subject to a detailed due diligence and shall require approvals by the applicable members of such Group’s deliberating bodies and appropriate contractual and financial documentation. The Agreement shall be governed and constructed in accordance with the law of [Country Name], all disputes, claims or proceedings between the Parties relating to the validity, construction or performance of this Agreement shall be subject to the exclusive jurisdiction of the [Country Name] Offices to whom the parties mutually submit themselves. Please acknowledge your agreement to the above by signing and returning the enclosed copy.